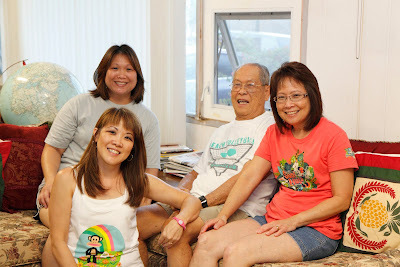 Today, I'm just gonna share a few photos from Dad's 90th birthday. We celebrated this past Saturday, although his actual birthday was on Monday. Here's Dad and my sisters... So happy with his ice cream cake! I'll be back tomorrow with a birthday card to share. Been exhausted when I come home from work so thought I'd take it easy for a couple of nights before I get a relapse of my bronchitis. This weekend took alot out of me too. Sunday was a sad day for me because it's my first Mother's Day without mom. So I moped around and cried for a while and it made me feel better to get it out of my system. Other than that, it was a nice and quiet day at our house. Hope you all enjoyed your special day. See you back here tomorrow and thanks for dropping in today! TFS your family pictures ... your dad looks terrific for 90. Waiting to see your card tomorrow - have a great rest of the week. Your dad looks great for his age! He looks so happy surrounded by his family & celebrating his birthday. Looks like he really enjoyed that yummy cake! Now we know where you get your sweet tooth from hah? Hehehehe!!! I know that the first of every holiday will hurt but remember that she will always be in your heart & that will never go away. Thanks for sharing your pics with us. Big, big hugs & kisses for you! 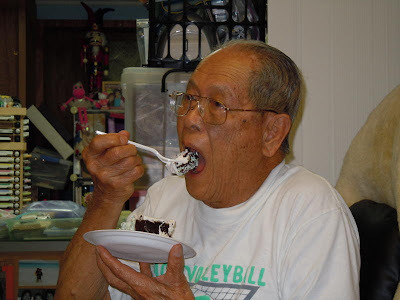 Teri: Those pixs are classic, especially with your dad enjoying his delicious cake. I'm sorry that this Sunday was so challenging for you. You were in my thoughts and I was praying that it wasn't going to be too difficult of a day for you. One day at a time, right?!! Happy 90th to your dad!! what a milestone. Also, thank you for sharing...I know that sunday was hard, but I hope that things get better everyday for you! Thanks for sharing pictures of your dad's birthday get together. What great pictures of you and your family. 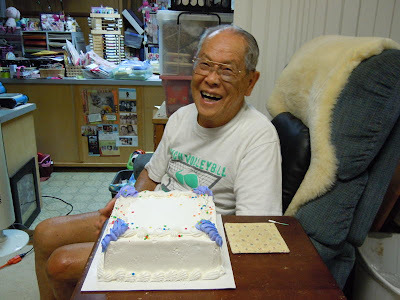 I am glad taht you dad enjoyed his ice cream cake. He definitely does not look 90. I was praying for you on Sunday knowing that was going to be a difficult one for you. TFS your family pictures with us! He looks very happy! Sorry to hear about your mother's day. Holidays are always difficult when you don't have your loved ones around. Take care of yourself. Your dad looks like he had a blast! What a wonderful family picture of all of you! Sorry about this Mother's Day being your first with out your mom. I hope you feel better. Happy birthday goon goon! is that how you spell it? he's so cute Teri! I love your dad! so much fun and so full of wonderful experiences that he loves to share. looks like he had a wonderful time at his party! love his cake too! we will have to stop by soon! thanks for today! it was fun to just go shopping and get out! hope Nolan likes his "dress" haha! ttyl! his age! Would've never guessed he was 90! Awesome! I'm awful sorry you had a difficult mother's day. I hope you're feeling better. My mom turned 90 on April 3rd. It's nice to meet someone from Hawaii! I had a friend stationed there for awhile, and I was able to go visit. I made a whole album of my Hawaii trip. And I'm glad I did, because my friend passed away 2 years ago. But I have all the mementos from the trip. I'm sorry about the loss of your mom. I hope it gets easier for you. Thanks for sharing. No matter what age, everyone loves an ice cream cake! Your dad looks great, Teri! Thanks for sharing some awesome pics! Happy 90th to your dad! He looks amazing!! Great pictures of happy times! Great pics of your dad! He looks good! Hang in there, Teri. Wish I could take away some of the ache for you. Thinking of you. Big hugs to you! Grandpa looks Great! I was so glad I got to see him the other night. He is such a pleasant man. Thanks for sharing these Beautiful family pictures. what a beautiful family you have! I'm glad that dad is doing well and he enjoyed his cake and special day with you! Take care of yourself- get some rest, don't want a relapse!